Webster University Emerita Professor of Voice Carole Gaspar is a graduate of Baylor University and Washington University. Her principal teachers were Leslie Chabay and Jennie Tourel. Throughout her career, she has won many awards including the G.B. Dealy competition, the Irene Jordan scholarship, the Shreveport Symphony Orchestra competition, the Southwest and Midwest Regional Metropolitan Opera auditions, the St. Louis Artist Presentation award, the St. Louis Philharmonic competition, and the National Society of Arts and Letters award in Chicago. Following six months of study at the International Opera Studio in Zurich, Switzerland, she performed with the Essen (Germany) Opera Company, making her professional debut as Marcellina in Fidelio. Since joining the Webster faculty in 1975, Professor Gaspar has earned seven diplomas from conservatories in Salzburg, Nice, and Geneva for studies in the poetry and music of the German lied and the French melodie. Her teachers have included Erik Werba, Kim Borg, Dalton Baldwin, and Gerard Souzay. Professor Gaspar has given numerous, highly acclaimed concerts in the St. Louis area and frequently collaborates with composers in premiering new works for solo voice. With a broad repertoire of 19th and 20th century songs, she has made an intensive study of the works of Brahms, Schoenberg, and other Viennese composers. She collaborated with Allen Carl Larson in many performances of works for voice and orchestra, and enjoyed an extensive career as a recitalist with pianist Daniel Schene. She founded and directed the Institute for Advanced Vocal Studies in Paris, France, from 1990 to 2001, a summer program devoted to studies in French classical song and vocal chamber music for emerging young artists taught by an international faculty of specialists in French music, language and literature. The Institute's activities have continued in the U.S. 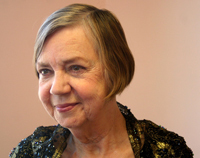 In 2002, she organized a weeklong workshop devoted to French vocal literature and the writings of Victor Hugo, bringing an international faculty of specialists to St. Louis. Active as a teacher, adjudicator, and music director in the U.S. and in Europe, her students are recipients of numerous awards. Many hold advanced graduate degrees and artist diplomas from outstanding schools of music, forming a veritable international community of professional performing artists and teachers.